The game of lacrosse is the oldest sport in North America. Rooted in Native American religion, lacrosse was often played to resolve conflicts, heal the sick, and develop strong warriors. To Native Americans, lacrosse is still referred to as "The Creator's Game". Lacrosse also served as a preparation for war. Legend tells of as many as 1,000 players per side, from the same or different tribes, who took turns engaging in a violent contest. Contestants played on a field from one to 15 miles in length, and games sometimes lasted for days. Some tribes used a single pole, tree or rock for a goal, while other tribes had two goalposts through which the ball had to pass. Balls were made out of wood, deerskin, baked clay or stone. 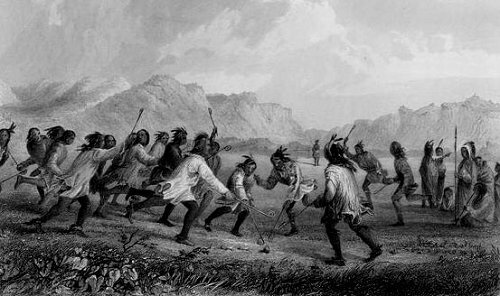 When the first Europeans witnessed a lacrosse contest in the early 1600s, some type of lacrosse was played by at least 48 Native American tribes all across the continent. French pioneers started playing in the 1800s, and Canadian W. George Beers standardized the game in 1867 with the adoption of set field dimensions, limits to the number of players per team and other basic rules. New York University fielded the nation's first college team in 1877, quickly followed by a number of New England prep schools. Today, there are 400 college and 1,200 high school men's lacrosse teams from coast to coast. The first women's lacrosse game was played in 1890 in Scotland. In 1926 the first women's lacrosse team in the United States was established at the Bryn Mawr School in Baltimore, Maryland.